This sale is for one pair of Bose 201 - Series III Direct Reflecting Speakers in Black. Great for music, to be heard the way it was intended like a live performance. This CD shelf stereo system allows you the convenience of wirelessly streaming your favorite songs from any Bluetooth-enabled device. It includes all of the technology you need to enjoy audio in a simple, easy-to-use device. It is very efficient in its sound at 95db (m/w), and does not require a huge amplifier to get great sound out of it. Magnet Type: 40 OZ. We are certain that you will be satisfied with your product and our service. 1 x Bookshelf speakers set. With the front facing bass reflex port, low frequencies are emphasized giving the bass more power. You can also alter your music from the ease of your couch with the wireless remote. 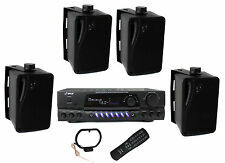 6 surround speakers: subwoofer, front left & right, surround left & right & soundbar. Wooden subwoofer enclosure. 5.1-channel RCA inputs: front left & right, surround left & right, center & subwoofer. Boasting a frequency response of 36 Hz to 20 kHz, these two-way floor-standing speakers let you listen to a range of sounds. These speakers are in excellent condition and they work and sound INCREDIBLE! Portable Bluetooth Speaker 10W Subwoofer Heavy Bass Wireless Outdoor Speaker MP3 Player Line in Speakers Support Remote Control FM Radio TF Card LCD Display for Home Party Phone Computer PC . Impedance: 6 ohm (Subwoofer)/4 ohm (Speakers). Modes: AUX, BT, FM Radio,USB, SD. It also makes a stunning gift for your coworkers, family and friends. Alternating light patterns will move along with the sounds of the music to delight your senses and add a special touch to the songs you know and love. They are in Excellent Condition Tested & Working. very minimal wear if ANY. One of the grilles has a small dent in it. See pictures for more details. Tested for Key Functions, R2/Ready for Resale Working Condition:Tested and Working. We can then adjust your invoice before checkout. Up for sale is (2) NEW MTX bookshelf speakers. Voice-matched for consistency throughout the entire Monitor family. We are certain that you will be satisfied with your product and our service. 2x 6.5" woofers in a ported cabinet for enhanced bass response. Dual woofers extend the bass response. 30W RMS, 60W Max. Ribbon tweeters produce an extended frequency response, with much lower distortion. These bookshelf speakers are in decent overall condition with multiple flaws on the finish. There are scratches, dings and scuffing through-out the speakers cabinets. The speaker w/ the serial #ending in 0059 has a pretty serious ding on the gloss finish border (front/top edge - left of right corner). Up for sale is (2) New in box MTX speakers. A bookshelf speaker with outstanding performance and great flexibility. Engineered from the ground up for accurate sound and exceptional imaging in real world situations, this is in line with the high standards of performance expected from MTX. Condition is Used. One corner has small crack, check my 4th picture. There is no major issues worth noting. Original owner. 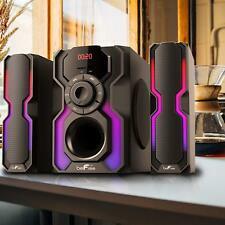 NEW MTX FloorStanding Speaker.Dual 6.5" Woofers.Home Theater Audio Sound.300W. Engineered from the ground up for accurate sound and exceptional imaging in real world situations, this in line with the high standards of performance expected from MTX. This use of offset drivers, crossover frequency, and slope provides better imaging and more realistic sound. But they are all working very well. Imagine the best of both worlds. You hear quality sound at an affordable price. However, Quart did not skimp on the sound. Both Quarts have a very solid sound, with an exceptional stereo image and accurate reproduction of voices. Polk Audio RM7400T Tower Speakers. Eliminating resonance in speakers results in a wide, smooth response and low distortion. The towers feature Power Port Bass Vents hidden under the grilles to extend and strengthen their lower-midrange performance for a seamless blend with the subwoofer output. One has slight nick on corner see photo. short original speaker wire is included but the rca jack has been removed. speakers do work. THESE SPEAKERS ARE IN OVERALL GOOD CONDITION. THEY DO SHOW WEAR FROM USAGE. THE CORNERS SHOW THE MOST WEAR. Liberty Pawn & Gold is owned and operated by Dave and Tammy Munsee. Dave is from Richmond and Tammy was born in Fredericksburg, VA.
Bose 301 Series 2 II Direct Reflecting Stereo Speakers Home Theater SEE & READ!! Sale is for Bose 301 Series 2 II Direct Reflecting Stereo Speakers Home Theater Conditions: Used and working missing the grills and also one of the cover is broken but nothing major Please reference the pictures Thanks Any question don’t hesitate to contact Visit my store Thank you!! Some cosmetic wear but in excellent working condition. Stands for speakers are missing but can be wall mounted or still stand on their own. POLK'S UNMATCHED QUALITY AT A AFFORDABLE PRICE. The baffle (front) panel of each cabinet is optimally angled in toward the listener. This serves to widen and improve the stereo image by radiating sound away from room boundaries and at an angle to opposing boundaries. Cheap Stereo Speakers. Subwoofer. Home Theater. Cheap Subwoofer. Speakers. Never ever used. Fresh from the box. All chords are inclusive and all accessories are inclusive. (See Pictures). I will match the lowest price you find. I just want to get rid of it because I need the money. Triad InRoom Gold LCR THX Certified. This speaker is in excellent condition with a few minor blemishes. I have a 2.1 set up and no longer in need of the 3rd speaker. Hathor Specs ™ employ premium pure copper foil inductors, the finest film/foil capacitors and nickel-chromium/ceramic resistors for all driver sections. See more about this below. Matching center channel and surround speakers. 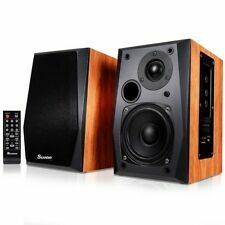 Pair of 2-way bookshelf speakers perfect for small room or multi-room applications. I have a 15' x 11' living room and these small speakers have decent output and even more surprising decent bass. Both of these factors would be greatly improved with the addition of a sub-woofer. These speakers have been tested to ensure the best possible quality. The speakers are in good overall physical condition. They work as intended. Jamo home theatre / Stereo Speakers NICE!! VERY NICE CONDITION, WIRES ARE HIDDEN IN BACK OF SPEAKER Jamo speakers are part of klipsch. 1x Bookshelf Speaker with Air Motion Tweeter. The woofer cone is constructed using New Zealand pulp paper, which features longer fibers than ordinary wood pulp. This allows for a speaker cone that is lighter and more rigid than cones made from ordinary paper to produce clear and accurate mids and tight, focused bass. Set Pair Zenith Home Stereo Table Speakers 8 OHM 2-2926 GA50-4J S912J 17"
Wires included. tested - sound good. minor scratches, face is good. Impedance: 8ohm. 1.5" voice coil. Up for sale is (2) NEW in box 10" woofers. We are certain that you will be satisfied with your product and our service. Stamped steel basket. Xmax: 1.0mm. Vas: 105.84 (liters). Woofer : 6.5" Woven Fiber Cone w/ 16.5 oz. Magnet & Rubber Surround. Tweeter : 0.75" Titanium Silk. Network Tools and Supplies. Midrange Speaker : 3.5" Woven Fiber Cone w/ 5.4 oz. This lightweight transducer produces a natural sound with significantly less distortion than conventional drivers. 1 Pair of 2-Way 3.25" Waterproof Audio Speakers in White, 120W Max. Network Tools and Supplies. Woofer Cone. Polypropylene with mica injection cone. Tweeter Cone. 3.25" polypropylene mica injection cone woofer. And with its slender lines and stylish glass base, the FS looks as good as it sounds. And you won't have to anchor yourself to one primary seat — you'll experience warm, natural audio throughout the room.